MC has eleven beautifully designed and decorated rooms with an intimate 'beach get-a-way' feel. The cozy beach house comfortably sleeps 11, over two thousand five hundred square feet of indoor living space, the perfect large front lawn along the ocean for lawn games/kids to run and over a thousand square foot wrap around deck. Plenty of room to enjoy the sun and ocean air. Mermaid Crossing is a five minute walk to York's popular downtown that features homemade candy shops, gift stores, playground, arcades, clothing shops and many fine dining options. York's Wild Kingdom is a mile away. Portsmouth's historic downtown, Kittery's famous outlet shopping and Portland's hip downtown are all a short driving distance. We can include car services to and from shopping, dining, golfing, sightseeing and Portland airport. Come enjoy Mermaid Crossing, an authentic Maine Clambake, home made salt water taffy, breath taking sunsets, cocktails on the new beautiful deck and with family! At Mermaid Crossing we will give you the perfect place to make memories, time and time again. Whether you choose the basic rental or the inclusive packages, you will enjoy exceptional customer service. We guarantee a vacation experience beyond compare. This is your vacation. Let us treat you. Elisabeth is here to help you plan and execute every vacation, family reunion held at Mermaid Crossing. With a degree in Interior & Graphic design and a passion for event design, Lis will make every moment memorable. Supporting local businesses and 'shop small, shop local' is Elisabeth's 'Maine' focus. Lis strives to incorporate local businesses in any way she sees possible. This gives Mermaid Crossing a true Maine feel. In Lis's free time she races mountainbikes, has competed in two world championship dogsled races and is a loving mother to her one year old son. She will also be getting married at Mermaid Crossing on August 2nd. Mermaid Crossing, a 1897 circa Ocean Front Beach Home at 49 Ocean Ave. Ext. at Shorts Sands Beach, will open its doors to vacationing families and their friends, Reunions and Special Events. This family-owned home is now a customized luxury rental property. A place to host fabulous events with an amazing backdrop;views of the Atlantic Ocean's sunrise and sunsets! New to this home is a 1000 sq. ft. refurbished wrap-a-round, covered porch attached to an indoor area providing a quit private space when one is needed. The charming beach themed decorated interior, has a well equipped kitchen ready to serve up a lobster dinner that can be prepared, if you desire by a personal chef, and enjoyed on the porch watching a breathtaking sunset. From July1st through Lobor Day, beginning at 7pm, you can hear live music from the beachfront Gazebo only a short walk from the local shops and restaurants as well as children's entertainment. From its views of the sea, to the garden by the ocean,the special atmosphere this unique home can provide is unsurpassed. Well we simply could write a book on the many ways Mermaid Crossing will allow its quests to enjoy a relaxed, stressless days of summer into fall. Mermaid Crossing is a five minute walk to York's popular downtown that features homemade candy shops, gift stores, playground, arcades, clothing shops, fine dining options and York's Wild Kingdom. Enjoy the uninterrupted views of York Short Sands beach, the ocean and the horizon while vacationing at this beautiful home. 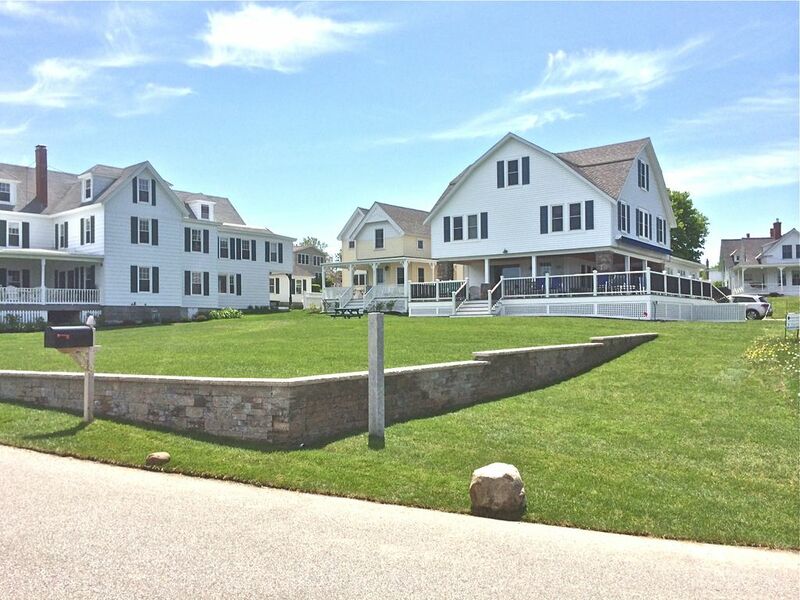 There are unlimited ways to customize your vacation package to cater to what you want in your stay at Mermaid Crossing in York, Maine. Do you want restaurant reservations, or authentic Maine clambakes catered meals? We can have our gourmet chefs come to you. Tickets to York's Animal Kingdom? Golf packages with a car service? Italian cooking lessons? Family scavanger games in downtown York with fun trivia? Let us pack your lunch for the beach, turn down your sheets, and have the spa come to you. Our event planners will help you get the most of your escape from reality. Fantastic location and a very comfortable home for a large gathering. Beautiful home with all the comforts! Gorgeous porch with plenty of room for everyone! Perfect location and home for our family reunion! Plenty of room for everyone with a very short walk to Short Sands and all the fun in the center! Mermaid Crossing is a beautiful home in a great location with spectacular views. When we arrived we were greeted by Lis, the property care taker, who is a pleasure. We enjoyed the time we were there. It has a great front lawn that overlooks the ocean, a short walk to the beach and town, and the rental includes everything. On a different note, some of the things that are listed in the rental were not available. We did not have a fire pit, access to kayaks, or AC units in every room, including one of the bedrooms. Also, the outside shower door was completely broken, which eliminated one of the showers. During our stay we had a sewer incident which was no one's fault. The caretaker, Lis, was very accommodating, but the owner, Deb, whom we never met or spoke to, was not. We were left without a shower or properly working toilets and her solution was a porta potty and paper plates. This was unacceptable for 11 people for 5 days. We did get a full refund, but only after Lis, the caretaker, pushed for it. Overall, the house is a great family getaway. It needs to make sure to update the list of amenities to be more accurate and the owner needs to be more concerned for her renters. Location was fantastic. House was even better. Great family spot!!! Can't say enough good things about the location and house. The house is great but more instructions on appliance use and switch locations would be great. We had no small children but with so many knickknacks that would be a problem. Had a great time. Property was perfect. So convenient. Can't wait to go back. York is the perfect vacation destination for families, couples, older or younger, for sight seers, shoppers, foodies, or hikers. where you are close to it all! York, Maine, is a historic coastal town featuring beautiful beaches and other attractions that make it a fun, family-friendly place to visit. Once a summer-only resort town, York has become a year-round vacation destination. According to the Greater York Region Chamber of Commerce, it was named as one of the 10 best places to vacation in North America by 'Money' magazine in 2002. York has four different beaches that are open the the public. Long Sands Beach, the largest in York, spans 1 1/2 miles, and attracts surfers, swimmers and sunbathers. It offers parking, restrooms, lifeguards and umbrella rentals. Short Sands Beach, which is also close to restaurants and shops, features parking and a playground, and offers evening concerts in the summer. Harbor Beach is situated along a beautiful rocky coastline; and Cape Neddick Beach, or Passaconaway Beach is York's smallest, with its sand bars and tidal pools exposed at low tide. According to the Greater York Region Chamber of Commerce, the Cape Neddick 'Nubble' Light is one of the most photographed and painted lighthouses in the world, and is visited by thousands of people each year. Upgrades and add ons can be done at anytime before or during vacation.